Simms new G4 Pro Sling packs incorporate larger openings for easy access to ample amounts of storage, hideaway strap capabilities, and magnetic tool docking stations. 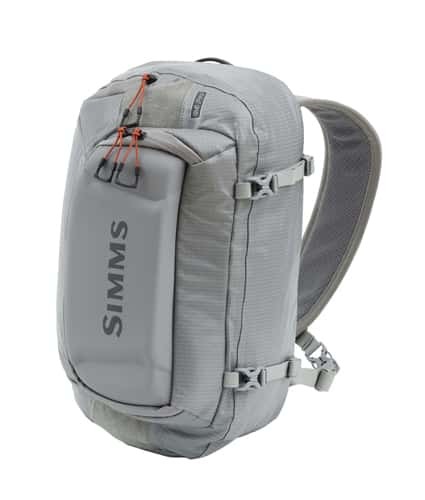 Simms G4 Pro Sling is an over-the-shoulder side-loader powered by a U-shaped zippered opening for easy access to the main compartment. The fold-down workbench, with tippet tender and floatant/shake holder attachments, is ideal for changing up and resuscitating tired flies. Additional features include a water-resistant interior lining for deep crossings, magnetic tool ports for amplified access and storage, an apt net carry system for easy access when landing a fish, and an ergonomically designed shoulder strap for all-day comfort. Fly line friendly with “tuck-away” or removable straps. I thought the opening to the bag was too tight. Difficult to get in and use all the functionality. The front pocket was small and if you use it for tippet, there is not much room for anything else. My L.L.Bean hip bag I was looking to replace is once again my favorite option. While the bag was a disappointment, I did have a great experience with the customer service. Very easy to return and I will continue to buy from here. This sling pack more than meets the needs of an angler looking to store a number of important items while wading and fishing. It has a very water resistant exterior, and the inside has adequate space and many interior pockets for storage of various items. After several outings with this sling pack, and I am very satisfied with my purchase. Just the right size for day trips in the surf. Really waterproof so my stuff doesn't get wet when jumping around in the surf. Platte River Fly Shop service was great.